I was walking along a sunny path in Parker, Colorado when I came across these rapids in Cherry Creek. That prompted the following vlog regarding noise. A gentle background noise can be relaxing while reading a good book. However, noise that prevents you from accessing corporate data to make “sound” business decisions…is never good! Mantis Pulse Analytics for sifting through the social media noise, finding customer conversations, tracking trending topics, and supporting customer engagement. 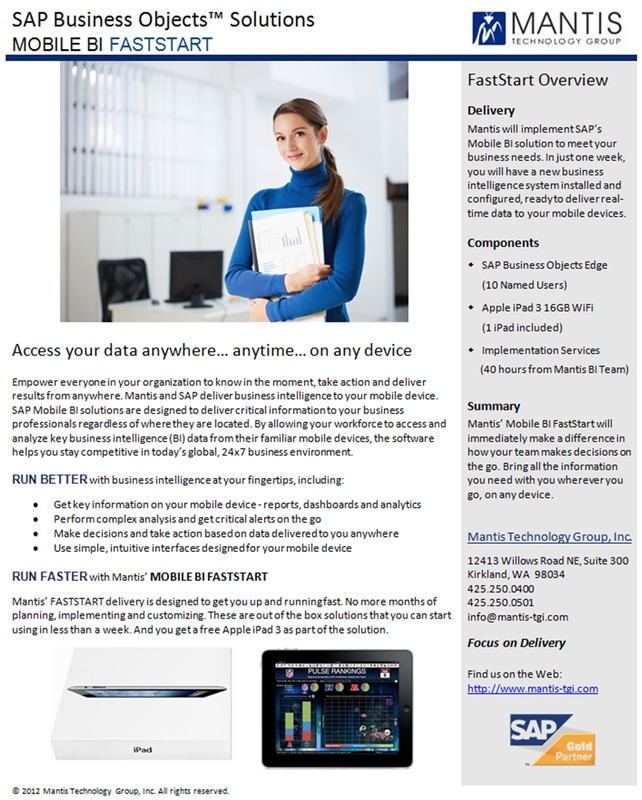 Mantis Mobile BI FastStart for deploying a business intelligence solution to access your corporate data anytime…anywhere. We even provide an iPad 3 as part of the package that also includes 10 Named User Licenses of SAP Business Objects Edge and 40 hours of Mantis professional services. Will you trust Mantis to help you sift through the data noise, regardless of whether it is in the social graph or behind the corporate firewall, so you can make business decisions that drive your bottom line success? Love catching you on video! Great way to connect the real world to social media. Thanks, Janice. I like to change the video venues just to make it interesting for the reader/viewer. Denver gives me plenty of sunny venues! Brian, aloha. As always, a great analogy. Having lived on the ocean for years, I know well the difference in noise levels between tide in/tide out as well as stormy seas/calm seas. In fact, when the tide was in and it was stormy, we couldn’t carry on a conversation in our home. And get stormy data in the unstructured world of social media data, or simply conflicting data between organizations of the same company, and you can be in for a wild ride. It takes strict data governance/stewardship and sound business intelligence principles to resolve data conflicts and make it usable and trusted within a company.